Surprisingly impressive, simple and easy. These are just some of the words we could use the describe the Joule sous vide appliance produced by American company ChefSteps. Despite our initial reservations about the usefulness of this appliance we begin to see just how versatile this nifty kitchen appliance is after only a few uses. It allows you to cook all kinds of things ranging from the obvious foods such as meat and vegetable dishes right through to desserts and yoghurt. Not only this but its hands off cooking process and consistent results makes you appear like a seasoned chef in your kitchen (even if you’re not). 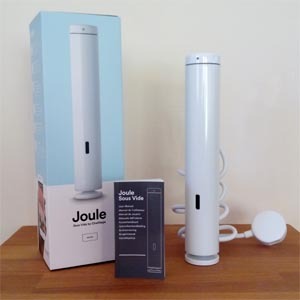 In this review we take an in-depth look at the Joule and provide the results from our test as we cook two basic foods that can often be tricky to get just right. Sous Vide is a method of cooking we’d honesty never heard of before. And, according to a spokes-person for ChefSteps, is a method more widely used in America that is gaining traction here in the UK. Essentially food is cooked within a plastic pouch or glass jar using precise temperature control to produce perfectly cooked meals time and time again. Cooking this way also traps moisture within the food and prevents problems some other cooking methods are prone to create such as drying out or burning the food. Not only that but you can add seasoning and extra ingredients to cook flavoursome foods and whole meals with ease. Plus, when the appliance essentially manages the whole cooking process for you. It becomes more easier to cook for friends and family and whip up delicious, wholesome food and treats with minimal effort. The Joule arrives with no extra accessories – simply because it doesn’t need them. After removing the outer sleeve and opening the box you’ll find the Joule and an instruction book offering basic safety advice, an introduction and where to find the app required to use the Joule. The Joule itself is a rather unassuming device. The top of the device acts as a button you can use to both start and stop the cooking process (although this can be also be achieved using the app) and integrated into this is a small indicator light. The colour and activity of this light indicates the Joule current state. For example a pulsing red/orange light indicates the Joule is pre-heating the water. 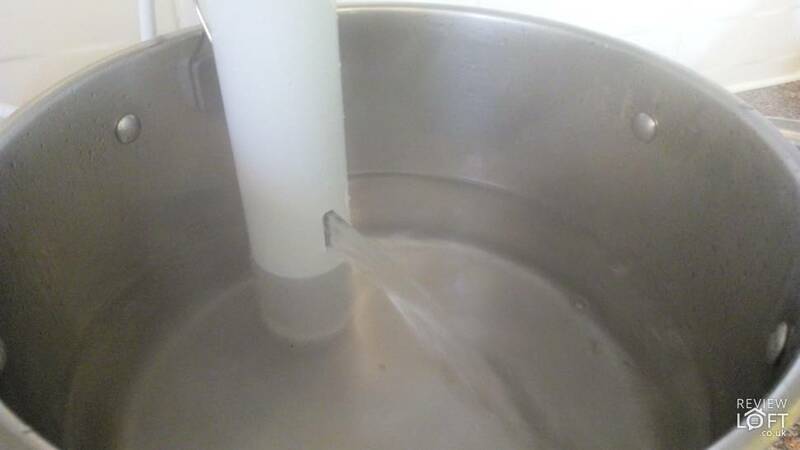 On the base of the Joule is a magnet for attaching it to the base of you pan and this is covered with a soft rubber coating to prevent scratches or damage. However, if some of your pans aren’t magnetic you can still secure the Joule in place using a retaining clip located on the back of the device. The end of the clip is also coated with rubber to prevent the risk of scratching or marking your pans. Setting up the Joule was surprisingly simple. To begin with you’ll need to download and install the Joule app, since this is required to control the appliance itself. A direct link to the app can be found in the supplied instruction manual but a quick search on Google Play was all that was required for us to find and install it. Once installed you need to pair the app with your Joule. To do this you need to ensure the app is open on your phone and then plug the Joule in. A small popup will appear and this walks you through the simple steps required to link them together. Rather irritatingly you do need to open an account to do this, but this required nothing more than your email address and a password so it was fast at least. 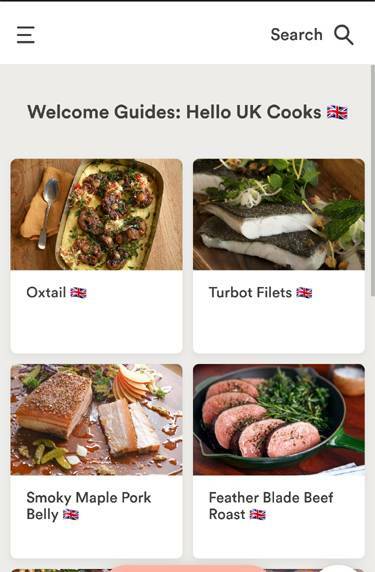 Once complete you’re ready to get started and the app launches a sort of ‘intro page’ that guides you through cooking your first batch of food. If you’d rather just browse the recipes you can skip this and return to the main menu – which is what we did. The app is incredibly impressive. Featuring a veritable cookbook of handy recipes it allows you to quickly find and cook a variety of foods/meals using the Joule. To find recipes you can either search for something specific or browse by category to find inspiration and ideas. In total there a 9 main ‘food type’ categories ranging from a variety of different meats (pork, beef etc) to vegetables and even desserts. Selecting a category loads a batch of different pre-programmed recipes for you to browse through and try. But, here’s where things get more interesting and shows just how well thought out the app is. When selecting a recipe a brief overview video plays at the top of the screen to give you an idea of what the end result should look like. Not only this but a group of interactive step-by-step instructions show you precisely how to cook your selected recipe. For example, if you’re not sure what a certain step is asking you do then click it. Clicking a step plays a short video showing you exactly how to perform the required action and helps make using this appliance almost fool-proof. 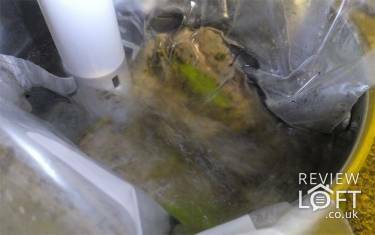 A major criticism of some sous vide appliances is that you need a vacuum bag to cook a lot of the recipes. So, it was great to see that many of the recipes for the Joule required nothing more than a zip lock bar or jar to get started. To test the Joule we picked two foods that can be tricky to get just right: soft boiled eggs and steak. Whilst this might not be the inspiring pick of foods we could cook they importantly test the Joule’s ability to maintain a consistent cooking temperature and deliver food cooked precisely to your specification. For example there is little leeway between a soft and hard boiled egg and it is something which is easy to over or under cook. The same can be said with a medium steak and is still something that is difficult to get right without cutting into the steak during cooking to see if its ready or not. Plus if the temperature of the pan is not right its very easy to end up with rubbery-steak. The cooking process for both starts exactly the same: First you need to select your recipe using the app and click start to allow the water to be preheated. A handy monitor on the app displays, in real-time, the current water temperature and alerts you when it is time to place in the food. 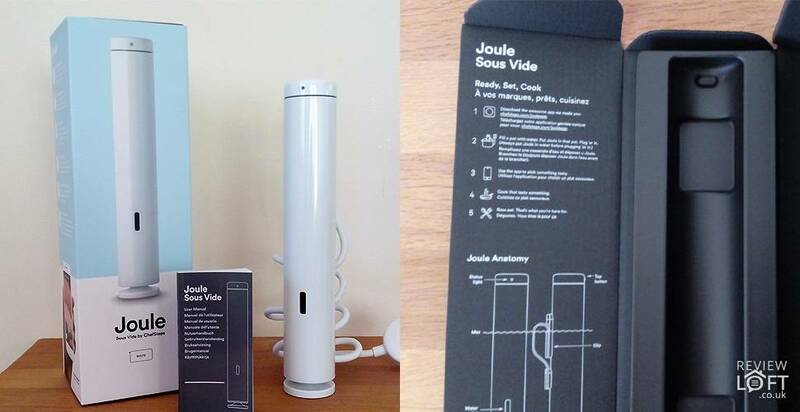 Secondly, after beginning the cooking process, you can leave the Joule to cook your food. A timer on the app shows you exactly how long is left and it will produce an audible alert when the cooking time has elapsed. All you need to do is remove your food – easy. Cooking eggs with the Joule was an interesting experience. Gone was waiting for the water to boil, quickly dropping in the eggs and then hoping the you’d set your timer for the right time. Instead we setup the Joule. Waited for it to alert us the cooking temperature was just right and dropped in the eggs. And, to our surprise, within 8 minutes we hard perfectly soft-boiled eggs. 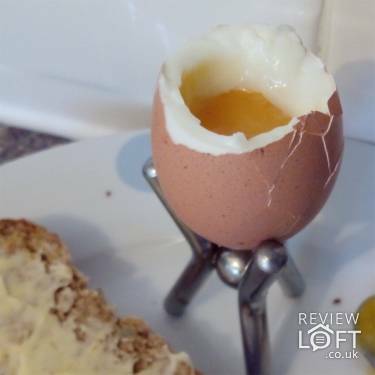 None of the eggs cracked (which often happens when we boil them) and the consistency of the yolk was just right to enjoy with toast soldiers. In-in-all a successful test which illustrated how precise in the temperature control of the Joule was. But, in the scheme of things, this wasn’t the most interesting thing we could have cooked so we thought we’d try something a little more tasty and tricky to get right – medium steak. Our second test was something a little more adventurous: ultimate steak. This recipe is available in the Joule app and involves searing and sealing your steak for a more intense flavour. To begin with sear the steak in a very hot pan of butter or oil to brown each side. Next add fresh thyme, a bay leaf and garlic cloves to your ziplock bag – along with a little of the oil from the pan and, obviously, the steak. Then you let Joule take over for you! We cooked our steaks ‘medium’ and this takes around 10 minutes. But, this does depend on how thick your steak is and, the Joule app has pre-set cooking times to accommodate everything from rare to well-done and many different sizes of steak. Once done we removed the steak from the ziplock bags and returned it to the hot pan to again brown each side a little more for 1 minute each side. The result was incredible. The steak was tender and really picked up the seasoning from the bag and provided the odd burst of intense thyme – which was delicious. This recipe was a hit and is definitely something we’ll try again. 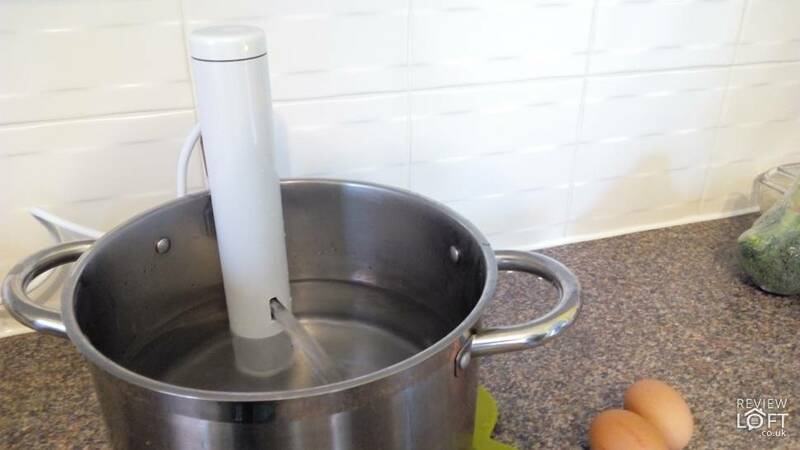 Initially we were a little unsure how the Joule could really benefit our kitchen. But after its first test we began to fall in love with its ease of use and hands off cooking that delivered perfect results. The only downside is that it is a little on the pricey-side. That said, its ease of operation, the fact that it can easily replace several different cooking appliances in your kitchen and allow you to prepare meals with the finesse of a Michelin star chef makes it a winner in our eyes.